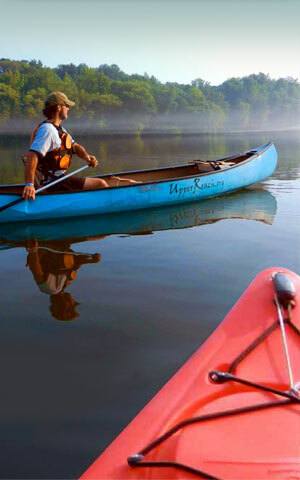 To ensure a safe and pleasant experience on the Southern Virginia Wild Blueway, always prepare carefully and be alert while paddling. Whether you’re looking for a few hours of fun with the family or a multi-day wilderness adventure for experienced paddlers, the Southern Virginia Wild Blueway offers everything you need. Check out accommodations, suppliers and other resources to help you plan the perfect trip. Allow us to help make sure you have everything you need for a memorable trip. Whether it’s a fishing license, canoe rental or just about anything else you can think of, we’ve got you covered. Single and double kayak rentals (unguided). Canoe and kayak rentals (unguided). Located at the entrance to Staunton River State Park. Canoe and kayak rentals (unguided); drop-off and pick-up services available. From hotels and bed-and-breakfasts to cabins and waterfront house rentals, there are plenty of lodging choices along the Blueway and in surrounding areas. One thing you can always count on is hospitality. Breezy Oaks Farmhouse is located in a secluded setting in southern Virginia, 4.5 miles from Virginia International Raceway. Comfort and hospitality oriented, Breezy Oaks Farmhouse specializes in getaways with jacuzzis, candlelight dinners, and couples massage. Travelers can enjoy rooms with private or shared baths and fireplaces. Family friendly with eight rooms. Our guests enjoy birdwatching and scenic views from our balcony and deck. We provide handmade aromatic soaps for all our guests and bedtime cookies on your nightstand. Our full breakfasts are served hot and vary daily. Massage therapy is available by appointment. We gladly customize business meetings, bridal parties, weddings, retreats, and other events. The inn is two hours from Raleigh-Durham and Richmond International Airports, and one hour from Greensboro. All major credit cards accepted. You will find quiet country elegance in this destination B&B w/ the additional option of a lakeside rustic cottage on our 190 acre estate. At Villa Cathedral we have 4 bedrooms available. Additionally the home is available to host weddings, family reunions, corporate events, special interest workshops and retreats. On the first floor at Villa Cathedral, there are two bedrooms, each with a private bath. Upstairs in this wing of the home you will find an apartment style suite which includes master bedroom/master bath, full kitchen and an additional bedroom/half bath. King and full sized beds available. When you walk into the beautiful and expansive great room which merges with kitchen and den areas, you will discover the high cathedral ceilings throughout, along with the baby grand player piano and lots of comfy spots to settle into. Our home was designed for large gatherings with your friends and family. In addition to the main Villa Cathedral house we have MerryBrook cottage on the lake. The cottage is a private rustic setting lakeside with 3 bedrooms, 2 baths and sleeps six comfortably. These bedrooms are used for additional B&B lodging however Merrybrook is also available for whole house rental. Built in 1880, this beautiful, Queen Anne Victorian jewel, sits in the heart of Virginia's Lake Country in the historic town of Boydton. It features large, airy and tastefully decorated rooms with attention to the heritage of the old south. Two blocks from the historic, Jeffersonian courthouse and 1 block any direction from the town's walking tour, it is the closest lodging to Rudds Creek (2 miles), Eastland Creek (5 miles), North Bend Park (9 miles), and John H. Kerr Dam (10 miles). The Southern Heritage epitomizes 19th century southern town life - slow, gracious and charming! Go to the website for more information. North Bend Park is located on John H. Kerr Reservoir. The 50,000-acre lake extends 39 miles up the Roanoke River along 800 miles of wooded, cove-studded shoreline with 70,000 acres of project lands and it's yours to enjoy whether you like to swim, fish, camp, go boating, or just relax and enjoy the scenic beauty. The campground offers 249 primitive and electric/water hookup sites on or near lake. A bicycle/jogging trail is in campground and a nature trail is nearby. Other amenities include an amphitheater, fishing pier with universal access, playgrounds, swim beaches, and 3 boat launch areas. Gas and groceries are just 5 minutes away. Three group camping areas are also available. Keats Point Farm is located on the Virginia/North Carolina state line, bordered on three sides by Kerr Lake. Dating back to the 1850s, our farm is now in the seventh generation of family ownership. Keats Point Farm offers everything you need for a day on the farm to a weeklong farm stay vacation. We can customize your package for a birthday party, field trip, corporate picnic, social gathering, or family vacation. You can have access to the lake and various lake activities during your visit with us. You can enjoy the rustic lifestyle of an old log cabin. View the interior of an old tier tobacco barn and the interior of a circa 1900 barn that housed the family mules and Bessie, the milk cow. Observe the old existing tobacco rows that can still be seen in the woods adjacent to Kerr Lake. We offer two cabins, one that sleeps 6 and another that sleeps 9. We also have tent sites for camping and RV sites with full hook-ups. We are also excited to offer equine boarding for those traveling with horses, with a full exercise arena. We are located on the north shore of beautiful Lake Gaston, just 5 miles east of the I-85 exit #4. Just look for us on the right side of Rt. 903. Lake Gaston Americamps is a family owned and family oriented campground with planned activities. a swimming pool kiddy pool mini-golf playground with slides & swings volleyball court basketball court horseshoe pits a pavilion 35 mile stocked lake Fishing licenses are required. We have large, level full hook-up pull thrus and waterfront sites. Cabin rentals are available for those who require them. We have live entertainment performing most weekends throughout the summer. We offer crafts, games, tournaments and treats for the children of all ages. We offer a well stocked convenience store in addition to RV supplies, accessories, and propane. We invite you & your family to share some time with us! Overlooking Bugg's Island Lake. Executive suites, honeymoon suites and king rooms available. Swimming pool - micro fridges, cable tv. Efficiencies are adjacent to motel. Floating docks, fish cleaning tables, deck/balcony overlooking lake, nice beach area. Additional parking for boats with electrical outlets. Free continental breakfast. Across the Lake from Occoneechee State Park. A modern Cabin sleeping 6 on Kerr Lake (or Buggs Island). Central A/C, Full Size Kitchen, Satellite TV, Privacy, Deck, 2 Bedrooms, roomy Living Area! Bedroom #1 has a Queen Bed and Bedroom #2 has 2 twin beds. A Queen Sleeper Sofa for 2 more people. One Large Bathroom! Easy to find! Located right off of Highway 58 but surrounded by trees for complete privacy. Kerr Lake is just behind the cabin. Launch your boat nearby at Buffalo Springs Campground/Park. It's very nice and 2 miles away with a playground, swimming area and large launching area! Historic, scenic Clarksville is only 5 miles away. The citizens and businesses will welcome you with their southern, small town hospitatlity. Kinderton Country Club is also in town and offers an 18-hole golf course designed by Donald Ross. Feel free to email questions! Cooper's Landing Inn & Traveler's Tavern is located in the heart of Lake Country and is a part of Virginia's only lakeside town. Cooper's Landing offers an inground pool and hot tub, casual fine dining, an outdoor patio and wine bar, and catering and full service wedding services. The home was built in 1830 and is surrounded by beautiful grounds, original outbuildings, and a beautiful private wedding garden gazebo site for your destination wedding or elopement. Clarksville affords its visitors fine dining, antique specialists,& gift shops that are happy to welcome all visitors with a smile. Mecklenburg County is surrounded by local history and showcases many historical and architectural gems including Prestwould, McCullum More Gardens, &Occoneeche State Park. Guests can also take to the outdoors to enjoy a boat ride on the lake, kayak trips, or a hike along the banks. At Coopers we are pleased to offer guests luxury resort services in a small, intimate romantic setting. We can arrange your in-room massage, private horseback trail ride, or pack you a picnic to take to a local winery. We offer room service, cocktail service and private dinners by the pool, seasonal live music outside on our patio, and fabulous dining in a historic but casual setting. Cooper's Landing is truly a romantic getaway in lake country. HOT TUB!!! Beautiful Chalet at Grassy Creek. Great quiet neighborhood - private roads for walking, biking. This upscale 4 bedrm 3.5 bath home entertains 12 guests. - Screened decks or balconies from every room overlooking lake. Outdoor hot tub, indoor Jacuzzi, pool table, washer/dryer, DVD, DirecTV. 1 king bed, 3 queens, 1 queen sized sofa bed, 2 bunk bed sets, 1 crib. Sheets provided. IN SEASON RATES: Please call office or see our always updated website: www.kerrlakerentals.com- NO Weekend rentals. Security deposit, 5.3% VA Sales tax, 5% County occupancy Tax NO PETS Cleaning fee: $150 Smoking outside only please. Enjoy the serenity of Kerr Lake, one of the largest lakes on the East Coast. Fishing, boating, & swimming is at its finest in the summer, but we're here all year round. Located in Southside Virginia, 60 miles from Raleigh/Durham, NC and 110 miles from Richmond, Clarksville's revitalized downtown is a place you'll enjoy visiting, with its numerous antique shops and eating places. Homes located on Buggs Island/ Kerr Lake. All homes are completely furnished and located on the Lake and have docks and can be used by families and fishermen alike for pleasure on the lake. Included are TVs, washer and dryer, grills, etc. These homes are located within the Clarksville, Virginia area and there are several public boat ramps available. Bayview Motel & Efficiences offers unique accommodations located in the heart of Clarksville's residential district. Stay overnight or longer and enjoy the quiet and beautiful surroundings overlooking Kerr (Buggs Island) Lake. We are walking distance to the water and the Clarksville Marina, and just a few blocks from shopping and dining in the historic waterfront downtown area. Our rooms are spacious, attractively decorated, individually heated and air conditioned. All rooms have cable television including HBO, and many other features for your comfort and convenience. This is the perfect home away from home for both vacationers and sportsment. On the peaceful shore of beautiful Buggs Island Lake, Occoneechee State Park is great for outdoor fun and relaxation. The park has more than 18 miles of trails that meander through the forest and along the lake's shore. Hikers, bicyclists and horseback riders enjoy the trails and the beauty of Virginia's Piedmont. The park is also a favorite of anglers and campers. The park has two six-bedroom lodges, nine two-bedroom cabins and two three-bedroom cabins. Several offer a view of the lake. All are climate-controlled but have no dishwasher, TV, phone or laundry facilities. Boat launching is free for overnight guests. From Memorial Day weekend through Labor Day weekend, cabins are rented by the week. Otherwise, a two-night minimum stay is required. Maximum occupancy and parking vary so please call the park for details. The Chandler House Bed and Breakfast located near South Boston Speedway was built in 1929. It's perfect for a romantic getaway or a cozy overnight stay on the way to the mountains. All of our rooms are tastefully appointed with antique furnishings and handmade rugs. Guests will enjoy our 450 count cotton bedding. Each room comes with a 25" color flat screen TV complete with satellite package. The Chesapeake Suite has a lovely antique cherry canopy bed. The suite features the bedroom as well as a small attached reading nook and a separate private bath with a clawfoot tub and shower combination. ($99.00 per night) The Blue Ridge Room features a handmade walnut queen size bed and matching highboy dresser. The attached private bath features a clawfoot tub and a separate custom tile shower. ($99.00 per night) Breakfast is included in the room price. Guests will enjoy a full country breakfast. Our common areas are open for all of our guests to enjoy. The second story porch overlooking the backyard and beyond is always popular. You can sit in one of the Adirondack chairs and read a book or enjoy the cool breezes. The Cotton Gin Retreat is located only five minutes from Rosemont Winery, Interstate-85, and Lake Gaston in Blackridge, VA. Two seperate units are available and each unit has two (2) full size log beds with full bath. Amenities include Refrigerator, Microwave, Coffee Maker, Satellite Television, Deck Equiped with Grill/Table/Chairs, and Outdoor Electrical Hook-Ups. Arrangements may be made for prepared meals. Linens are provided. For equistrian enthusiasts, the popular Roanoke Regional Tobacco Heritage Trail is just minutes away. For the fishing enthusiasts, the pubic boat landing is a 5-minute drive from the Cotton Gin Retreat. Hunters are also welcome. Please come visit us at the newly renovated Cotton Gin Retreat. Staunton River State Park is one of the six original state parks that opened in June 1936. It is located on 1,597 acres along the shoreline of the John H. Kerr Reservoir (also known as Buggs Island Lake), as well as the Dan and Staunton rivers. The largest lake in Virginia is only one of the park’s many attractions, which include a swimming pool, camping, cabins, picnic shelters and nature trails. Cabins: A week-long stay is required between Memorial Day and Labor Day. The week's rental period begins on Sundays. Camping: Each campsite has fire rings that can be used for campfires or cooking. Swimming and boat launching free with overnight reservations. Camping Lodge in campground area: The three-room trailer has seven sets of bunk beds. It includes a tent-only campsite for up to six people. Open year round. Restored country mansion designed with simple comforts in mind. Seven bedrooms for single or double occupancy, with six modern bathrooms. Also on site is a full service banquet facility able to serve up to 200 guest. Activities: fishing, guided hunts in season, horseback riding, hiking or just relaxing on the wrap around porch complete with rocking chairs and breathtaking views. Conveniently located within an hour of major airports and cities and only 5 miles from William Tuck private airport. Near South Boston Speedway and 20 miles to VIR - Virginia International Raceway. Americas Best Value Inn-South Boston is located just a few minutes from shopping, industrial development parks and the South Boston Speedway. We are conveniently located within walking distance to restaurants and shopping areas, and just a few miles away from Virginia International Raceway(VIR) and 50 miles away from Martinsville Speedway. We have well equipped and extremely clean rooms with most affordable rates in town. All 76 rooms come with a high-speed internet (Wi-Fi), microwave/refrigerator, air conditioning, satellite TV(HBO, ESPN, Spike TV, BET, and etc. ), coffee pot, alarm clock with AM/FM radio; hair dryers available, as well. We have Mexican Restaurant inside and outdoor pool make our hotel much more then a place to stay. The Days Inn, South Boston, is a magnificent and comfortable! Shangrila Guest Ranch provides all inclusive horseback riding vacation packages and hourly or day trail rides by appointment. Complete packages available including lodging, meals and guided trail rides. Custom and group packages also available. The farm is an exciting place to be any season of the year. No matter which season is your favorite, we have activities to enjoy all year long. There is something for everyone - singles, couples and families. There is a stocked pond for fishing and feeding the ducks. The ranch experience is an excellent opportunity for quality time together. Shangrila Guest Ranch provides a family oriented atmosphere in a country setting. Take the time to slow down and enjoy life...and take the memories with you of a lifetime! Visit our website for current pricing. Charles Bass House B&B, 1904 Guest Suite with private bath and sitting room and Guest Room with shared bath. Listed on South Boston's walking tour, this Queen Anne home is located in the historic district. Charles Bass, the original owner, built the house in 1904 when it was prestigious to live on the main street in town. Many of the homes in the neighborhood are from this era. The Charles Bass house is within walking distance of downtown with shops, restaurants and churches. While my guest, I want you to feel at home. Be comfortable throughout the common areas as well as in your private quarters. Relax in the hot tub or on the deck. Satellite TV with HBO is available in your private quarters. Off street parking in driveway off Moore Street. Close to gourmet restaurants, wineries, auto racing, state parks and historic sites. Welcome to Oak Grove Plantation, the home of the Easleys and Craddocks since 1820. The antebellum home in Cluster Springs, which has hosted many visitors, is operated as a bed and breakfast by Pickett Craddock, the fifth generation of the same family. We are environment-friendly, have an electric car charger and photovoltaic solar power. In 2013, 2015 and 2017, we were honored by Virginia Green as the greenest B&B in Virginia. Oak Grove Plantation offers bedrooms with fireplaces, comfortable period furniture and family pieces. The elegant parlor and cheerful sunporch provide common space for talk and reading. In the Victorian dining room you will be served a full country breakfast in the tradition of Southern hospitality. The plantation has 400 acres available to you for hiking and biking on farm roads and paths. Open May through September. Located 25 minutes from Virginia International Raceway. People with hybrids and electric cars can have a third night free. Virginia's premier resort and conference center, Berry Hill, nestled amongst tree lined forest covering 650 acres, this National Historic Landmark welcomed its first guests to the beautiful Virginia countryside in 1728. Today, The Berry Hill Resort & Conference Center continues to offer unequalled hospitality, elegant accommodations and distinctive Southern charm. Our luxury resort combines history and tradition with a seemingly endless array of indoor and outdoor activities. Our historic resort is a convenient, leisurely drive from many East Coast cities. We have taken the style, charm and tranquility of the past and blended it with state-of-the-art technologies and luxurious amenities to offer our guests the very best for both business and pleasure. Let our golf, spa, recreation and vacation packages enhance your stay. South Boston Inn is located at the junction of 360 west and route 58. 45 minutes from South Hill. 30 miles from Danville and 35 from Durham, NC. Near South Boston Speedway and VIR. Near many attractions, restaurants, rivers and lakes. Clean, comfortable rooms at Budget Prices! Easy access to Downtown South Boston. Newly remodeled! Luxury At Less! Free HBO, Weekly rates. Reasonable Rates, free local phone calls, daily and weekly rates available. The Greenwood Inn in South Hill offers convenient proximity to the interstate as well as downtown South Hill. This is a great budget-value inn alternative to the larger chains. Offering complimentary wireless internet access. Most of the 17 units offer updated kitchens and bathrooms. The BEST WESTERN PLUS South Hill Inn is a family-friendly hotel located just off of Interstate 85 in South Hill, Virginia. This hotel offers convenient access to Virginia's beautiful Lake Country, which include Lake Gaston and Kerr Lake (aka Bugg's Island Lake). The town of South Hill offers guests the South Hill Model Railroad Museum and the Virginia S. Evans Doll Museum located downtown in the restored South Hill Depot, The Tobacco & Farm Life Museum in Virginia, and the Colonial Theatre, as well as many more area attractions. The BEST WESTERN PLUS South Hill Inn's spacious and affordable guest rooms are each equipped with a microwave, refrigerator, cable satellite television, 32-inch flat screen televisions and free wireless high-speed Internet access. Amenities at our charming Virginia hotel include an outdoor swimming pool, fitness center, business services and meeting facilities. In addition, a complimentary full hot breakfast is available. We are about 15 minutes from both Lake Gaston and Kerr Lake, as well as the John H. Kerr Dam. Many local and chain restaurants are within a short drive or walk of the hotel. Fairfield Inn and Suites South Hill offers unexpected comforts on the road with enhanced bedding, spacious rooms and suites, 100% non-smoking Hotel and a central location just off I-85 and US 58. Microwave and fridge in suites, Early Eats complimentary hot breakfast, with Jimmy Dean breakfast sandwiches, indoor pool, whirlpool, exercise room, free local calls, fax/copy service, business center. Our central location to area attractions provides the ideal place to stay for comfort and convenience. Kerr Lake, one of the largest lakes in the Southeast, is only a short drive and offers fishing, boating, and scenic trails for nature walks. Also nearby is Gaston Lake for fishing and water sports. Fairfield Inn and Suites South Hill looks forward to providing you with the exceptional service you deserve and expect at an affordable price. Stay near the Rosemont Vineyards & Winery and the Tobacco Farm Life Museum at the pet-friendly Comfort Inn & Suites hotel in South Hill, Virginia. Nearby attractions include Centennial Park, the Veterans War Memorial, Doll & Train Museum, Lake Gaston, Prestwould Plantation, Occoneechee State Park, MacCallum More Gardens and Parker Park. Enjoy our exercise room. Free amenities include WiFi and hot breakfast. Rooms feature a flat-screen cable television, microwave, refrigerator, coffee maker, hairdryer, iron, board, safe and voicemail. Select rooms contain desks, whirlpool bathtubs and wet bars. Connecting rooms are available.Our boardroom accommodates up to 7 people. Computer, copy and fax services are offered. Guest laundry services are available. Buses and trucks are welcome. We look forward to your stay at the Comfort Inn & Suites Hotel in South Hill, VA.
Little Cedar Lodge and Campground is located on the Dan River in Halifax County, Virginia. The property includes a cabin (one bedroom/one bathroom)and three campsites with with water, septic and electric hookups (30/50 a). The cabin sleeps between one and four people. Fishing, canoeing and duck hunting are available directly from the site. There is a public boat landing within a couple of miles from the property. In addition, the property is only 14 miles from the Town of Clarksville, Virginia. The town is located on Kerr Lake, which is also known as Buggs Island Lake. The 50,000-acre lake is popular for both boating and fishing. The fishing includes catfish and many varieties of freshwater bass, including largemouth bass, striped bass and crappie. Please call us for more details and information. Waterfront camping is allowed only in designated campgrounds; lucky for you, we have those in abundance along the blueway. An array of State Park, Corps of Engineers and private campgrounds await overnight paddlers. Facilities: 21 sites for tents or RVs; amenities like hot showers, flush toilets and a dump station. A swimming beach and picnic area make the campground ideal for families. Facilities: 66 sites for tents or RVs; amenities like hot showers, flush toilets and a dump station. A swimming beach and picnic area make the campground ideal for families. Facilities: 244 sites for tents or RVs; amenities like hot showers, flush toilets and a dump station. A swimming beach and picnic area make the campground ideal for families. Facilities: 88 sites for tents or RVs; 13 cabins; 11 equestrian campsites; amenities like hot showers, flush toilets and a dump station. Miles of lakeside trails, an archery range, a marina with boat rentals and close access to Clarksville make this a perfect getaway. Facilities: 99 sites for tents or RVs; amenities like hot showers, flush toilets and a dump station. A swimming beach and picnic area make the campground ideal for families. Facilities: 47 sites for tents or RVs; 8 cabins; 13 equestrian campsites; amenities like hot showers, flush toilets and a dump station. Over 17 miles of multi-use trails, an olympic sized pool with huge slide, several boat launches and access to outstanding fishing and paddling. Facilities: 83 sites for tents or RVs and several cabins. Breakfast before your trip or dinner after — the restaurants around the Blueway can satisfy any appetite. Find your favorites or experience some local flavor. The Copper Kettle is renown for its "killer seafood" and is the best place to dine for real seafood. Open for evening meals only, it boasts of fresh seafood, specialties, fine wines, and occasionally has live entertainment on Saturday nights. Located two blocks from the old courthouse (Business 58). It is a "must do" on your visit to Southern Virginia. Pizza,Pasta,Subs and more. Beer and Wine on premises. Waterfront Lake Gaston! Our menu now features your favorite appetizers, salads, burgers, and lunch items, in addition to six brand new dinner entrees. Our Flip Flops Bar is doubling in size and will now be a full service bar featuring mixed beverages, and bottle and draft beer. We will also have dining accessibility. Come out enjoy dinner, drinks, and great entertainment while taking in the beautiful views of Lake Gaston. Plus don't forget The Shady Shack still has pay-at-the-pump gas for filing up your boats and other water crafts, snacks, sodas, ice cream, sunglasses, and apparel -- all you will need for the lake life. The Great Wall Chinese Restaurant specializes in Cantonese & Mandarin Style. Lunch buffet week days. Dine in or take out. Lunch specials, House Chef specials, Hunan & Szechuan special dishes. Located in the heart of Lake Country in Clarksville, the only town on the famous beautiful Buggs Island Lake/John H. Kerr Reservoir. We welcome all tourist and visitors to "Virginia's Only Lakeside Town". The Lamplighter located on the famous Buggs Island Lake offers a casual dining atmosphere. Full breakfast, lunch, & dinner menus. Daily specials, Salad Bar, and Prime Rib specials on Friday night. Fishermen and lake goers welcome. Relaxing Lounge serves your favorite beverages and drink specials. Craft beer on draft, growlers available, NFL ticket in Lounge. Clarksville is located in the heart of Lake County on beautiful Buggs Island Lake/John H. Kerr Reservoir, the largest man-made lake in Virginia. We welcome all tourist and visitors to "Virginia's Only Lakeside Town". Subs and salads available. At intersection of highway 15 and 58 in historic Clarksville, Virginia's only lakeside town, on beautiful Buggs Island Lake/John H. Kerr Reservoir. We are a farm to fork casual fine dining restaurant located in a historic 1830's Inn. Our menu reflects each season and changes monthly to include blackboard specials that highlight certified Black Angus meats, fresh fish,& local seasonal vegetables and fruit. We have intimate seating for 2 as well as private dining rooms for groups. We offer on & off premise catering and special event planning.Our dining area, tavern, and patio seating are open to the public and guests of the inn. Enjoy a glass of wine from our extensive wine list, an organic hand blended pomegranate martini, or a smooth, ice -cold imported beer. In the winter we invite you to curl up to the wood stove and sip on one of our rich ports or venture out to the fire pit for S'mores. We have a full bar for all your top-shelf desires. Come enjoy our margaritas, specialty martinis, and after-dinner cordials. The outdoor trellised brick patio & bar is open for dining and nightlife with our summer series "Live Music Under the Stars." A casual dining experience in a beautiful historic house, located only blocks from the lake in Clarksville, Virginia's only lakeside town. Great for families, groups, or even romantic dinners! Porch dining offers an opportunity to stop by and enjoy some coffee and a piece of pie while looking down on the historic downtown area. There are lunch and dinner specials daily, a full bar and wonderfully tempting desserts. Bare Bones is a wood-fired food truck that focuses on quality ingredients and detailed preparation. Our cuisine can be clasified as traditional East Coast. We are trying to preserve how things used to be done. All of our breads are made in house with Organic North Carolina Flour, our meats are smoked over wood only pits, and our sausages are all handmade. We are teaming up with local producers of pork, naturally raised vegetables, eggs, flour, and dairy to produce the highest quality product available. Caparatta's Restaurant & Lounge - known locally as the Pizza Pub. Italian; open 7 days a week; live entertainment & DJ's on weekends; pool, games, big screen TV, dance floor, pool tournament. Pizza, Italian dishes, subs, steaks, seafood, southern homecooking. Located in historic downtown Clarksville, Virginia's only lakeside town, on beautiful Buggs Island Lake/John H. Kerr Reservoir. Molasses Grill has made Downtown Halifax a hot culinary destination. Chef and owners Steven & Karen Schopen prepare a wide variety of appetizers, entrees & desserts which fuse the best of Southern traditions with cutting edge, diverse tastes -innovative specials prepared daily with seafood delivered fresh from the Atlantic coast or the finest cuts of meat- homemade baguettes and desserts are all made fresh, daily. There are also plenty of options for vegetarians. Made from locally sourced ingredients whenever possible, every dish is memorable. Like the menu, Molasses Grill’s ambiance is also an eclectic blend consisting of rich woods, classic lighting, and distinctive textures. Sit at the bar and enjoy a Virginia, domestic or international wine, single malt scotch, or try the hottest new martini with an appetizer. Perfect for candlelight-seeking couples, entertaining business associates, or gathering with friends and family. The Packhouse serving home cooked breakfast and deli style sandwiches for lunch. Deliver is available. Call us for our catering menu. The Packhouse Cafe offers home cooked breakfast and deli style sandwiches. Currently opened 7:30 to 3:30. Deliver and take out available. Also offering catering. Located next to Halifax Floral & Framing. The Windmill Farm Bake Shop is a family-owned Mennonite bakery and deli. Located in South Boston's Hupps Mill Plaza, Windmill is known regionally for their breakfast muffins, sweet breads and doughnuts. For lunch, Windmill offers fresh and home made soups, deli sandwiches and delicious sides such as potato salad, coleslaw and more. The shop is clean, comfortable and offers local music, arts and crafts for sale. Windmill is a local favorite and a familiar lunch stop for visitors passing through on vacation or business. Open for dinner Monday through Friday at 4pm. Lunch and dinner available Saturdays and Sundays starting at 12 Noon. An ecelectic cafe/ restaurant serving home baked pastries, sandwiches, tomato pie, quiche, salads and specials as well as a tasty breakfast. Wine and beer are available as well as gourmet products, salads by the pound, whole quiches and tomato pies as well as belnded coffee drinks, smoothies, ice cream sodas and more. Local art for sale as well as hand crafted pottery, jewelry and accessories. Since 1958, Ernie's has been a fixture for the local folk and the travelers, serving generations of local and out-of-town guests. Enjoy classic, southern dishes specially prepared from the kitchen, or from our family-style buffet. Our varied menu and family style atmosphere have brought customers back time and time again. We take pride in knowing that some of our faithful patrons began coming to Ernie's as youngsters and now are bringing their children to Ernie's. We have met so may people over the years, some local and out-of-town. Enjoy your visit and please come back again. We are located on 360 West / 501 South near the town of South Boston. Enjoy the areas best drivers battling their way to the finish line on Saturday nights at "America's Hometown Track", a NASCAR sanctioned 4/10 asphalt oval track. Racing excitement and affordable family entertainment for over 50 years! Home of the best NASCAR Late Model Stock Car Racing in the nation. SoBo is the breeding ground for many of today's top NASCAR competitors, including Sprint Cup Drivers Jeff Burton, Denny Hamlin, and Elliott Sadler. "A Dining Destination with The Standard of Excellence" Southern Living, March 2008 Casual, upscale restaurant and bar offering Infused New American Cuisine in a cozy, cosmopolitan atmosphere. Award-winning Chef/Co-owner Margaret Moorefield utilizes the freshest ingredients in her 27 entrées, 12 appetizers, soups, salads, desserts plus nightly specials. Winner of WINE SPECTATOR'S Award of Excellence, BISTRO 1888 offers over 100 international wines and a wide selection of Virginia wines, plus single malt scotches, premium spirits & beers. Reservations available online on YELP. Family restaurant. Adjacent to Best Western Motel; Buses welcome. Fast food restaurant serving continental breakfast, lunch, and dinner. Fast food restaurant serving breakfast, lunch, and dinner. El Saucito is a rare authentic Mexican restaurant for the region featuring a pretty big but solid menu, with weekly specials. Expect large servings, fresh meats and vegetables, and very friendly service. And now, recently added: beer and margaritas! Located just off I-85 at Exit 12. So come by, whether you're just passing through or spending the week at Lake Gaston or Kerr Lake. Known for their delicious donut holes! Opened in July 2016, our mission is to sell delicious and remarkable food and drinks. That the food and drink we sell meets the highest standards of quality, freshness and combines both modern-creative and traditional Italian styles of cooking. To consistently provide our customers with impeccable service by embodying true Italian warmth in our work. To have every customer who comes through our doors leave impressed by Luca's and excited to come back again. Menu ranges from tasty appetizers to start, delicious salads for a lighter fare, and Traditional and Modern Italian dishes for the true home cooked experience...All accompanied with our FRESH gelato with rotating flavors. Benvenuto a casa (Welcome Home)! We are a traditional Southern-style barbecue restaurant serving delicious smoked meat, old-fashioned sides, and a range of desserts, all made fresh onsite daily. We rise with the rooster and so does our smoke! Serving lunch and dinner Monday-Saturday 11:00AM-8:30PM! Having your family visit or a large event? We offer catering services and can handle large orders! Give us a call and we'll set you up TODAY!